Has it been awhile since you’ve been on a bike? Do you want to learn how to bike safely? 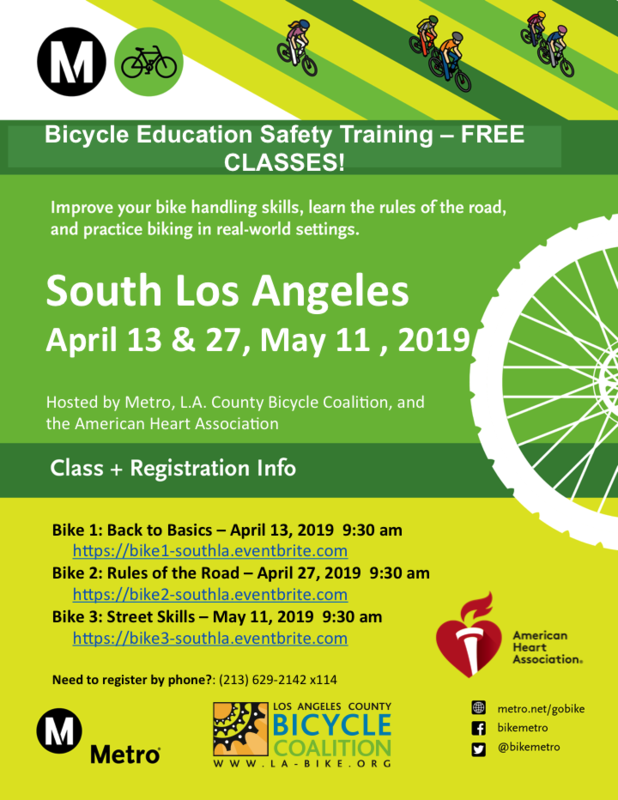 The Bike 1 – Back to Basics class, presented by Metro, the Los Angeles County Bicycle Coalition, and the American Heart Association will help you improve your bicycling skills. You’ll learn how to start and stop with confidence, scan, and signal. We’ll show you how to adjust your bike and helmet before a ride, and teach you how to perform a simple inspection to ensure your bike is road-ready. This is not a Learn to Ride class. Sign up on Eventbrite and get the location. This is a free 2-hour class for adults and teens who would like to learn how to safely and legally ride on city roads. We will teach you the rules of the road, how to plan your route, and provide tips and trips to make bicycling for everyday travel safe and convenient. From what to wear to bicycling etiquette, we’ve got you covered! This free 2.5-hour class is for adults and teens to practice safe riding with a group of beginning cyclists. You’ll learn cycling etiquette, practice riding in a real-world setting, and make pit stops at local establishments to get refreshments.